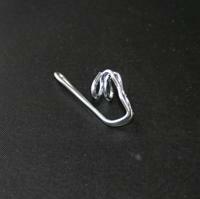 Our Galvinised Steel Gathering Hooks come in a pack of 25 and is suitable for Pencil Pleat Curtains only. They slide into the chosen pocket on the pencil pleat heading tape and flip over before hooking into the track glider or small ring on the rod and ring set. All Curtains Rings and Hooks will be posted out seperatley to your Curtains so they get to you safely. We have had some go missing when we sent them out with our curtains so we now rely on Australia Post, one despatch fee of $7.50 will be added to your hardware order to cover registered postage and packaging.